My house loves Purex. It gets our clothes clean and it smells fresh. Like I've explained in the past, my daughter has very sensitive skin. She's a teenager but I have to clean her clothes in the gentlest detergent I can find. We like the free, because it doesn't harm her skin. 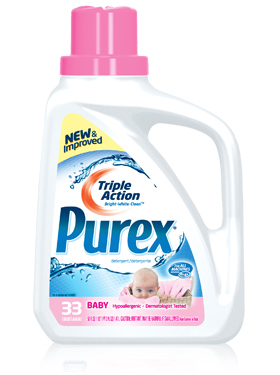 But when we had the chance to review the Triple Action Baby Purex, we thought we'd try it. Personally, I love it when my clothes come out of the washer smelling fresh, but with the Free, there is a next to nothing smell. With the Baby Purex, there is a very light fresh scent. The clothes were clean, which I was also worried about. Now the real test was whether she would get a rash. I'm happy to say that she didn't! In fact, she loves the light, fresh scent and the fact that her clothes were clean and soft. If you have little ones in sleepers, Purex Baby is also safe for fire-retardant clothing. So I'm thrilled that I can now offer my daughter an alternative to the Purex Free! Purex Baby is good for baby clothing, but also those who need a gentle cleaner for sensitive skin. *I received a product sample as a purex insider in exchange for my own opinion. I use Tide... because my aunt is allergic to a lot of detergents and Tide has consistently kept her from having an allergic reaction! Purex sometimes for colors, but mostly a cheap store brand. This would be awesome to win. Thanks so much for the chance! I use Tide. Thanks so much for the fantastic giveaway and happy New Year! We are currently using purex with oxiclean. I buy whatever is cheapest at the time or on sale, right now we're using Tide. I use the store brand of whichever store I'm in. Purex and I can use some more ,Thanks for chance. 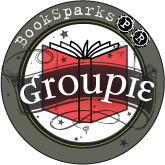 I use whatever is on sale or what I have a coupon for! Purex Baby. I love the smell, price, and that it doesn't break any of us out. We use Purex Free and Clear. I use All Free and Clear. this is what we use- great price and gentle on our skin! I use the purex pods right now. We use the purex free and clear! i actually use and like Purex. I do use Purex products, Purex Crystals right now. I use Purex, much more affordable than the other baby detergents. However, free is even more afforable. Right now I am using Seventh Generation. Tide is my current detergent. I use Tide right now. Thanks for the giveaway...we use "All HE Liquid Laundry Detergent, Free & Clear" currently.